Jiann-Ping Hsu College of Public Health, Department of Health Policy and Management, Georgia Southern University, Statesboro, Georgia. Correspondence and reprint requests to Bobbie Jo Newell, Jiann-Ping Hsu College of Public Health, Department of Health Policy and Management, Georgia Southern University, PO Box 8015, Statesboro, GA 30460-8015 (e-mail: bnewell@georgiasouthern.edu). 1. Kateh, F, Nagbe, T, Kieta, A, et al. Rapid response to Ebola outbreaks in remote areas - Liberia, July-November 2014. MMWR Morb Mortal Wkly Rep. 2015;64(7):188-192. 2. Pillai, SK, Nyenswah, T, Rouse, E, et al. 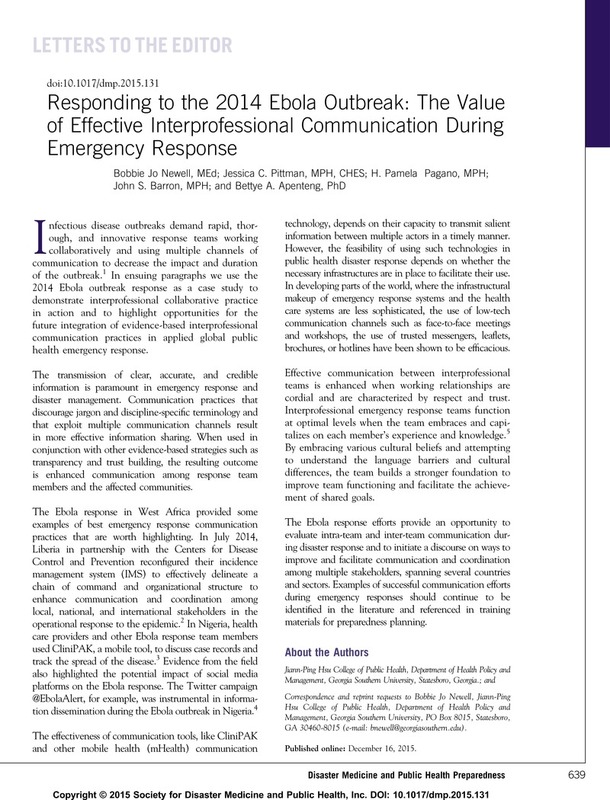 Developing an incident management system to support Ebola response—Liberia, July–August 2014. MMWR Morb Mortal Wkly Rep. 2014;63:930-933. 3. West, DM. Using mobile technology to improve maternal health and fight Ebola: a case study of mobile innovation in Nigeria. Brookings website. http://www.brookings.edu/research/papers/2015/03/11-mobile-technology-nigeria-west. Published March 11, 2015. Accessed April 5, 2015. 4. Carter, M. How Twitter may have helped Nigeria contain Ebola. BMJ. 2014;349:g6946. doi: http://dx.do.org/10.1136/bmj.g6946. 5. Pfeifle, A, Earnest, M. The creation of an institutional commons: institutional and individual benefits and risks in global health interprofessional education. J Law Med Ethics. 2014;42(4):45-49. doi: 10.1111/jlme.12187.